Liu Zhonglan, nearly 80, continues to shoulder her husband's "duty" to clean the public toilet in their village. In Qingshan District, in Wuhan, capital of Central China's Hubei Province, there is a small, shabby public toilet. Xie Wuxian, a veteran who served in the Chinese army during the War to Resist US Aggression and Aid Korea (in the early 1950s), volunteered to clean the toilet for more than five decades. After Xie died from cancer in 2015, his wife, Liu Zhonglan, and their children and grandchildren have used their spare time to shoulder Xie's "duty" to clean the toilet. Almost every weekend, residents in Chezhan Village, administered by Qingshan District, hear laughter from a family who lives in the village. They know it must be Liu's five children, who are returning home to visit the elderly woman, who is approaching 80. Liu's home is too small for her big family to gather for a meal, so they eat in a restaurant. 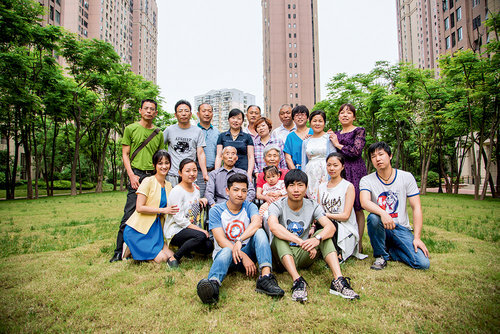 The family has a 20-member WeChat group, entitled "What a Big Family." Liu does not use a smart phone, so she is not in the chat group. But all of her children and grandchildren like to communicate via WeChat. They use the chat group to share good news about their family members, such as birthdays and job promotions. In May 2017, they were excited when they learned their family was named a National Most Beautiful Family. Xie Qiang, Liu's eldest grandson, went to Beijing to receive the award, in the Great Hall of the People. Xie Qiang took some photos during the ceremony. He later posted the photos in his WeChat Moments and his family's chat group. He expressed gratitude to his grandfather, who passed away in 2015. "Dear grandpa, our family was named a National Most Beautiful Family. The efforts made by you and others in our family have been well recognized by our country. Thank you so much for creating such a harmonious family," Xie Qiang wrote on his WeChat Moments. Xie Wuxian was a native of Shaoyang, in Central China's Hunan Province. When he was alive, he often told his family to show gratitude to both the Communist Party of China and the government of their home country. His loyalty to the Party and his motherland influenced his children and grandchildren. In the early 1960s, a simple and crude shed was built in the newly constructed Chezhan. A ditch, covered by some scattered wooden boards, was inside the shed. The shed was the earliest public toilet in the village. At that time, Xie Wuxian often used his spare time to clean the toilet. He often pulled the weeds that were growing around the shed, so passersby could find a clean road to the toilet. Now, the toilet, which has been renovated twice, contains flush toilets to keep the space much cleaner. Liu said she initially could not understand why her husband volunteered to clean the dirty, smelly public toilet. "My husband said since it was the only public toilet in our village, if he helped maintain the toilet, everyone in our village would benefit from the clean public space. Even though our children asked him to have a rest after his retirement, he insisted on cleaning the toilet in his spare time," Liu recalled. While he was suffering from cancer, Xie Wuxian spent his last days — from April to September 2015 — in hospital. He asked his wife and children to continue to clean the public toilet after his death. Liu agreed. She has since cleaned the toilet twice a day. Her eldest son, Xie Changqing, and her eldest grandson, Xie Qiang, have helped her clean the toilet. "My husband used to work here for more than five decades. Now that I continue to fulfill his duty … I often feel as if my husband is by my side," Liu says. Liu gets up at 5 a.m. every morning. She spends at least two hours sweeping several of the streets in her residential community. 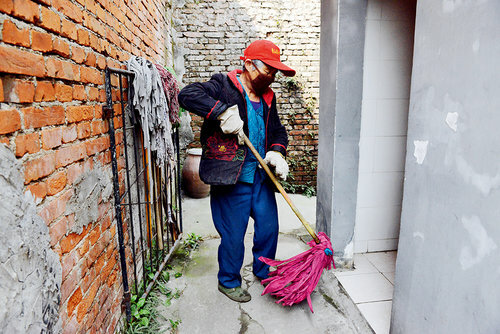 Xie Changqing, who works nearby his mother's community, often helps Liu sweep the streets. After she cleans the streets, Liu returns home to take care of her yard, in which she grows vegetables. Then she goes to clean the public toilet, usually after 9 a.m. Sometimes, Liu's children take her sightseeing in other cities. Before she travels, Liu always asks someone who stays at home to help clean the toilet. Xie Changqing says his parents have impressed and influenced their children and grandchildren with their diligence and harmonious husband-and-wife relationship. "Diligence is the best gift my parents have left to me and my siblings. My parents were both hardworking when they were young. My father earned a living for our family. To help my father, my mother had several part-time jobs in the plants in our village. She carried cement, stones, coal and iron slag to earn extra money," he recalls. Liu is happy to see her children have inherited the moral virtues of being diligent, strong, optimistic and warmhearted. "My eldest, third and youngest children look like me. They are all mild-tempered persons. The other two children look more like my husband. They are more tough and strong," the mother explains. Xie Changqing has built and decorated a house, which is not far from his mother's house. However, Liu refuses to move into the new house. She says her house contains more than five decades of precious memories of her life with her husband. She is satisfied if her children visit her every weekend. The old house is part of the community, which also includes the public toilet and the streets Liu cleans every day. Xie Wuxian and his wife pose for a photo with their big family (May 2015).